HA note: The following series will run each weekday this week. It is reprinted with permission from Libby Anne’s blog Love Joy Feminism. Part five of the series was originally published on Patheos on April 24, 2013. 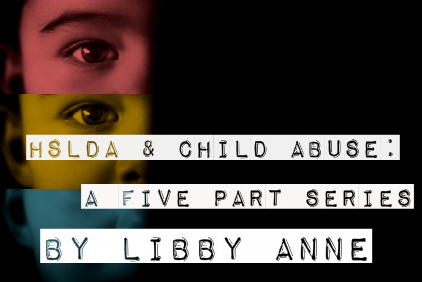 In this series examining the actions of the Home School Legal Defense Association (HSLDA), we’ve discussed HSLDA’s efforts to minimize child abuse reporting, stonewall child abuse investigations, and keep excessive corporal punishment legal. In this post we’re going to change gears and look at HSLDA’s efforts against homeschool regulations, efforts that, in effect, remove compulsory education and legalize educational neglect. Mr. Klicka added that the only regulation he found “reasonable” was that families notify authorities of their plans to home school. Other requirements, including record-keeping on childrens’ progress and either standardized testing or year-end portfolios to demonstrate competence, all required in New York State, were currently being challenged in eight active court cases nationally. In other words, the only regulation HSLDA’s Christopher Klicka—and the organization itself, as we will see—views as acceptable is requiring homeschooled students to give their local schools notice of their intent to homeschool when removing their children. HSLDA’s basic line is that it is the parents’ responsibility and right to direct the education of their offspring, and that they should therefore not be interfered with. HSLDA does not appear to believe that children have any sort of right to be educated, because the organization opposes any way of ensuring that homeschooling families actually educate their children. In HSLDA’s perfect world, parents would not be required to ensure that their children receive an education—instead, it would be up to their own discretion. The problem here is very similar to HSLDA’s problem when it comes to child abuse. Both educational neglect and child abuse do take place in HSLDA member families, and they also take place in families that merely use homeschooling as an excuse to educationally neglect and physically abuse their children. (And yes, this does happen.) But the organization appears to be both oblivious to the fact that any of its member families might be guilty of educational neglect or child abuse (because they’re good Christian families!) and not at all bothered by the fact that homeschooling is being used as a tool to enable other families to abuse or neglect their children. If all homeschooling families were like the one I grew up in—if all homeschool parents put the same emphasis and importance on academics that my parents did—HSLDA’s absolutist deregulation stance could perhaps be defended (though not necessarily by me). But not every family is like mine. Homeschool regulations very drastically from state to state. Ten U.S. states don’t even require that parents register their homeschools with the state education authority, let alone any testing, curriculum, or portfolio requirements. In these states, compulsory education has in practice been repealed. Other states, though, do have oversight of homeschooling. Pennsylvania, for example, has the highest level of regulation of homeschooling, requiring parents to turn in curricular plans at the beginning of the school year (for approval) and submit portfolios of students’ work and written reports of their progress composed by certified teachers at the end of each school year f0r evaluation, along with standardized test scores every third year. This high level of regulation, however, is a bit of an abnormality. In order to explore HSLDA’s stance on homeschooling regulations, as well as its lobbying power, I am going to use Texas as a case study. Texas is probably the most unregulated state in the country when it comes to homeschooling, and HSLDA has worked hard over the years to keep it this way. As I look over this history, I will quote from HSLDA’s e-alerts, messages it sends out to its member families, often with requests for lobbying action. In Texas, homeschools are counted as individual private schools—and there are no regulations on private schools in Texas. None. While private schools—and thus homeschools—are technically required to teach “reading, spelling, grammar, mathematics, and good citizenship,” there is nothing checking up on them to ensure that they do this, no mechanism to catch ones that aren’t, no evaluation requirements, no curriculum requirements, and even no registration requirement. There is, then, absolutely no oversight whatsoever of homeschooling in Texas. The dispute in this class action centers on whether the private school exemption includes children who are taught at home, in a bona fide manner, a curriculum designed to meet certain basic education goals, including a study of good citizenship. The court concluded in its decision, then, that the private school exemption did indeed apply to homeschooled children—or at least to homeschooled children who were “taught at home, in a bona fide manner, a curriculum designed to meet certain basic education goals.” There is nothing in the Leeper decision that bars the state educational commission from creating oversight of homeschooling—and in fact, the decision explicitly states that. Specifically, the TEA [Texas Education Agency] is not precluded from requesting evidence of achievement test results in determining whether children are being taught in a bona fide manner. Technically, this decision required that those who were given an exemption from the state’s compulsory education law to be educated at home be taught “in a bona fide manner” using “a curriculum designed to meet certain basic educational goals.” However, the Texas legislature never passed laws providing oversight of homeschooling after the decision was handed down, leaving homeschools to be overseen in the same way that private schools are—which means not at all. As a result, these nominal requirements have never been worth more than the paper it’s written on. A bill has been introduced in the Texas Legislature that will require all homeschoolers to be registered with the state commissioner of education. HSLDA is completely opposed to any registration or controls on homeschoolers in Texas. Senator Barrientos introduced the bill, S.B. 586, on February 24. It was referred to the Senate Committee on Education. We need your calls to Senator Barrientos to urge him to withdraw his bill. There can be no compromise. Senator Barrientos capitol number is 512-463-0114. His fax is 512-463-5949. His e-mail is gonzalo.barrientos@senate.state.tx.us. Be polite, yet firm that there is no room for compromise. In this e-alert, HSLDA makes it clear that it opposes any oversight of homeschooling, even something as simple requiring homeschoolers to register with the state educational authority. But what really struck me is that whoever wrote up this e-alert comes across as completely missing the point—the bill requiring homeschoolers to register was proposed so that local school districts could enforce the existing truancy laws, so simply suggesting that these laws need more enforcing makes no sense. Further, asking that homeschoolers register—merely put their names on a list—posed no threat whatsoever to parents’ freedom to homeschool, regardless of what HSLDA implies in this alert. I explained the history of home schooling Texas and that there was no room for compromise. Homeschoolers are content with the present legal climate and enjoy the freedom they have fought so hard to obtain. A second call was placed to determine if they would withdraw. The aide said she would recommend that they not withdraw the bill. Officially their position is that they will not withdraw the bill at this time. We informed her that we inform our membership. Let Senator Barrientos know homeschoolers want him to withdraw his bill. Thanks for standing with us for freedom! This is how HSLDA operates. No compromise. We will inform our membership. We are standing for freedom. No compromise. This “we want to protect the sanctity of homeschoolers” bit—which HSLDA quoted the state senator’s aide as saying—is interesting, because I think there is a strong case to be made there. Do homeschoolers really want homeschooling to serve as a shelter for abuse or as a cover for a school dropout problem? Senator Barrientos clearly hoped that requiring homeschoolers to register would ensure that legitimate homeschoolers would be protected while dropouts could more easily be taken to task for their truancy. But HSLDA would have none of that—and no compromise. Thank you for your time and effort spent protecting homeschool freedom! Many of you have responded to our elert of Feb. 28 notifying you of Senate Bill 586. This bill would require all homeschoolers to be registered with the state commissioner of education and would open the door for further regulations. Texas homeschoolers enjoy the greatest liberty to homeschool of virtually all the states. Senator Gonzalo Barrientos (the sponsor of S.B. 586) is offering to amend the bill, but no amendment would be satisfactory since it would involve some limit on the freedom of homeschoolers. Unlike many other states, homeschoolers in Texas have the clear blessing and protection of a landmark Texas Supreme Court case. There is no need to compromise. HSLDA’s Texas Legislative Counsel Tom Sanders visited Senator Barrientos’ office and he learned that the senator has received over 1,000 calls and 1,000 emails from homeschoolers expressing their opposition to the bill. We encourage you to continue to contact Senator Barrientos. While no action has been taken on the bill so far, we want to make sure to send the message that Texas homeschoolers are opposed to any change in the law. HSLDA opposes the bill as it requires parents to send written confirmation to the commissioner that the parent will “adequately teach the child based on curriculum designed to meet basic education goals.” This opens the door for further regulation to determine what is adequate instruction and who determines adequacy. It would require additional legislation to determine the “basic education goals” for homeschoolers. This is a pattern I’ve noticed—HSLDA inevitably interprets any law that effects homeschooling in any way as a potential Trojan Horse, opening the floodgates that will (somehow) result in a de facto ban on homeschooling. Still, in this case it makes especially little sense, because Leeper itself, which HSLDA cites here as its freedom charter for Texas homeschoolers, already opened the door to regulation when it used words like “in a bona fide manner” and “curriculum designed to meet certain basic education goals,” wording almost identical to that that this bill would require homeschool parents to affirm. But then, if the HSLDA didn’t react in this way to every little law, it wouldn’t have material to frighten homeschoolers into buying their legal insurance. Homeschoolers killed S.B. 586, the homeschool registration bill. Our consistent message was “no compromise,” and the sponsor got that message from your calls (over a thousand as estimated by a staffer). Those thousands of phone calls and thousands of emails? This is how HSLDA gets its work done. And time and again, time and time and again, HSLDA succeeds. In fact, it succeeds in getting its way on essentially every homeschool bill it touches. In an attempt to ensure that public school districts aren’t disguising high school dropouts, the Texas Education Agency is conducting an audit of students who withdrew under the auspice of home schooling. TEA officials wouldn’t reveal details of the audit — other than to say that the state is contacting a random sampling of families to validate that they intended to home-school when they left middle or high school. More than 22,620 Texas secondary students were listed as withdrawing to home-school in 2008 — raising a red flag among some experts and educators who worry that Texas’ lax regulations are encouraging abuse in the hands-off home-schooling category. The 2008 figures reflect a 24 percent jump from the prior year and roughly triple the number of high school home-schooling withdrawals from a decade ago. “They looked at the numbers and data a little more closely and decided to go a little more in-depth,” TEA spokeswoman DeEtta Culbertson said. If parents who withdrew their children to homeschool were required to register with the state, we wouldn’t have a problem with public schools recording dropouts as students leaving to homeschool in an effort to cook their books, and if there were at least some educational oversight we wouldn’t have a problem with dropouts claiming they’re homeschooling in an effort to avoid truancy laws. But don’t bother mentioning any of that to HSLDA! A new documentation requirement will make it harder for students to leave the public school system under the guise of home schooling, closing a loophole in Texas’ dropout statistics. Starting this school year, a parent must submit a signed statement saying that a withdrawing student intends to study at home, regardless of the child’s age. Documentation requirements also are being stiffened for students who say they’re leaving to enroll in a private school in Texas or a school outside Texas. In either of these circumstances, a student is not counted as a dropout. This change in policy took place without need for a law—it was a change in the school system’s paperwork. In fact, this change didn’t actually require homeschoolers to notify school districts of their intent to homeschool when withdrawing their children—something that still isn’t required in Texas even today. Instead, the change meant that if the schools wanted to list a student as having left to be homeschooled in official school documents counting the number and flow of children, the administration would have to get a signed statement of intent to homeschool. And if the parent didn’t want to give that—and they didn’t have to—the administration would be out of luck. According to the Houston Chronicle, the Texas Education Agency has now implemented its new policy to combat public school attendance fraud by requiring public schools to more fully document whether a withdrawing student intends to homeschool. Texas law does not require parents who choose to teach their children at home to file any sort of notice of intent. Thus, the TEA cannot mandate parents to file any such form. However, HSLDA always recommends that parents who withdraw their children from public school inform the school of their intention, lest the sudden absence of the child create grounds for concern. Members can find a sample withdrawal letter on the members-only section of our website. This letter should serve as the parent’s signed statement required by the TEA’s new policy. Should you encounter any school district that tries to force homeschooling parents to sign any statements regarding the enrollment of their children, please contact HSLDA immediately for assistance. It is absolutely true that HSLDA encourages new homeschoolers to notify their intent to homeschool when removing their children from a public school (notify, notregister) and it appears from the quote with which I began this post that HSLDA would be okay with requiring parents to give this notification. But that’s it. Nothing more than bare, basic notification. HSLDA is opposed to any oversight of homeschooling whatsoever, and if you read the organization’s literature, it’s as though they don’t realize the practical results of their deregulation efforts. In a state like Texas, a parent may remove her children from the public school and, whether or not she notifies the school district of her decision to homeschool, keep her children at home and teach them absolutely nothing. After all, how is anyone to know? How is anyone to ensure that education is taking place? In effect, it appears that HSLDA’s goal is to—in practice if not in name—make compulsory education a thing of the past, allowing parents to opt their children out of formal schooling for any reason and without any requirement that they actually educate their children. I understand where they are coming from—they believe in the supremacy of parents’ rights and parents’ total control over their children’s upbringing—I just strongly disagree with it. Their policies also, in effect, legalizes educational neglect. And indeed, in an article on compulsory education laws HSLDA stops short of openly coming out against them but nevertheless takes a very critical view of their very existence. And again, this isn’t hypothetical—it impacts real people and real lives. In 2011, Stephen L. Endress conducted a survey of public school administrators in Iowa and Illinois as part of his dissertation project. While his response rate was low, he found that his several hundred respondents reported that they believed that, on average, 25% of those who left their schools stating intent to homeschool were actually doing so specifically to avoid truancy laws. And when homeschooling regulations are low or nonexistent, there’s nothing to stop people from doing that. This, quite simply, is the result of HSLDA’s advocacy. Your background is far too dark, making reading your post annoyingly impossible to read. I was homeschooled in PA and the “high regulation” was not really very cumbersome. My mom had to send information about the textbooks she planned to use for the year, we kept a portfolio of all of our work, and at the end of the school year, we went to meet with our evaluator. The portfolio evaluation was always fun; I got to tell an interested outsider about what I’d done that year, and she often convinced my mom that she needed to cut me a little slack and not expect college-level work from an 11-year-old. There was mandatory standardized testing in 3rd, 5th, and 8th grade. My grandma had been a school teacher and so she usually administered mine– very properly, mind you. But once I took the test at a homeschool co-op the next county over and saw such blatant cheating that I was horrified. A mom was administering the test to her own child (against the rules) and if the girl started to mark down an incorrect answer, her mom would say “No, that’s not right; look at the question again.” So if anything, I think that even in Pennsylvania there should be a little MORE oversight. Wow you hit the hail right on the head! I was homeschooled in Texas most of my life and was pretty much abused every way you can imagine—but because we homeschooled (of course my mother was very active in the local republican party too) everything was pretty much swept under the rug, including the fact that she did not actually teach us kids beyond a second or third grade level. She always referred too or called HSLDA for “help” too. I taught myself schoolwork as best as I could and went to college. Still, I was hard for math and science subjects, as I was about a fifth grade level or so in both. In Texas its the law that you have to take several core curriculum classes that include math and science courses before you can graduate with a bachelor’s degree. If I hadn’t taken three math developmental classes and studied extra books for science I would still be at an elementary level of math and science. It’s hard for people to wrap their heads around the fact that I taught myself though, that for the most part there was no teacher, no parent, nobody but me and God— The scary thing is that happens to pretty much EVERY homeschooling family. Mothers would complain about not liking a kid because of their personalities, using those very words, and saying they wouldn’t teach them high school subjects. Then they would justify it by saying high school wasn’t needed in the 1800’s. A few families were actually ok, but they were either the truly deeply religious ones, the very hippie ones, or the try to be as normal as possible ones and otherwise few in number compared to others. Many parents also would often say how it was ok to kill kids, even adult kids, who were rebellious—rebellious including such things as not being conservative enough and not standing for homeschooling–or even for urging a parent to teach or have a tutor teach their kid algebra or something. I think HSLDA is just another pedophilic and destroy education advocacy group to be honest. Your post was so enlightening I hope change and more regulations comes soon to Texas! it made me so happy to see that there are people who care out in the world! I completely agree with you!!!! I live in a state where the only requirement to homeschool is yearly notification. There is no oversight, no accountability. I personally know of several situations where the children aren’t being taught and have met a few results of these lax laws. It’s deplorable! While there have definitely been times that the HSLDA has helped in legitimate situations of government over reach, I fear that if the HSLDA continues in their stand against any and all regulation, homeschooling itself will be made illegal. The large and growing number of child neglect and abuse case among those taking advantage of the system will demand it. I have my children tested, I keep a portfolio, and I use an umbrella school. I practically BEG our county’s homeschool liaison to look at it. She never has. We have become friendly and I have hear the horror stories. I’ve also heard of the victories when the neglected “homeschooled” children were returned to school to graduate. She has had more than one cry and thank her for getting back to school because they want to learn. We can stick our heads in a hole a pretend it doesn’t happen. We can argue that it is right to put a burden of accountability on a homeschooling family, however, in the end, even Jesus was accountable to God. I believe His cup was much more of a burden to bear than testing or keeping a portfolio. The more regulations you give to the state in homeschooling the more our freedoms to choose curriculum, the time frame we homeschool in, the co-ops we use and even support systems that exist in many areas will ALL become “controlled by the state.” This is not freedom and it is unfair to say that if someone homeschools their kids that they are child abusers or neglecting their educational responsibility to their children doing so. I don’t see anywhere where HSLDA would condone child abuse but rather, the protection of freedoms to choose and implement homeschooling as a viable option for parents to use if they do so or choose to do so without the state interfering. The state interferes enough and does no good. Take a look at the public school system if you don’t believe me. It’s a MESS!